What a wonderful city! Dubai is undoubtedly a fun planet for kids. The city reveres children and offers abundance of activities, which is ultimately extravagant in value to the cost and novelty. Water parks, theme parks, skiing and rides top the list of fun fun things to do in Dubai with kids; however, pools, hotels, kid’s clubs and beaches are among the tamer activities. And if your feet start dragging, you are certainly not too distant from a park or an ice-cream parlor to rest and enjoy. The wonder city has plenty of picnic areas and playgrounds for your young ones. Likewise, for the older kids, you may consider activities like camel-riding, sand-boarding or trekking; that are arranged and reasonably priced by many local tour businesses. Reputed as ‘Millionaire’s Playground’, Dubai is an ultimate place to take your kids for a fun holiday. Dubai is a dreamland for your children, no matter of what age they are. The city coddles almost any child; so if you are thoughtful about what you will do with your kids in Dubai – the list is endless. All you need to be careful about is the time that you choose to travel. Because temperature is the only concern, as we don’t want your child to wilt in hot summers, when the temperature can reach up to 500C. Here are some of the best fun activities that you can line-up with your kids in Dubai. Located inside the Dubai Creek Park – Bur Dubai; Children’s City is the first learning city and one of the finest educational and fun attraction for your kids aged between 2 and 15 years. It is a tremendous blend of learning center, exhibits, galleries, planetarium and nature center. The place offers stimulating and interactive activities blended with realistic phenomena of space, nature, culture, science, human body, etc. Children’s city allows your child to enjoy interactive experiences of real-life professions. Here, you can also identify the future interests of your child, but the most amazing part is to photograph your young one as cute little pilot, a chef or a doctor. For a day full of fun, a visit to the Children’s city should be in your list of things to do in Dubai with kids. 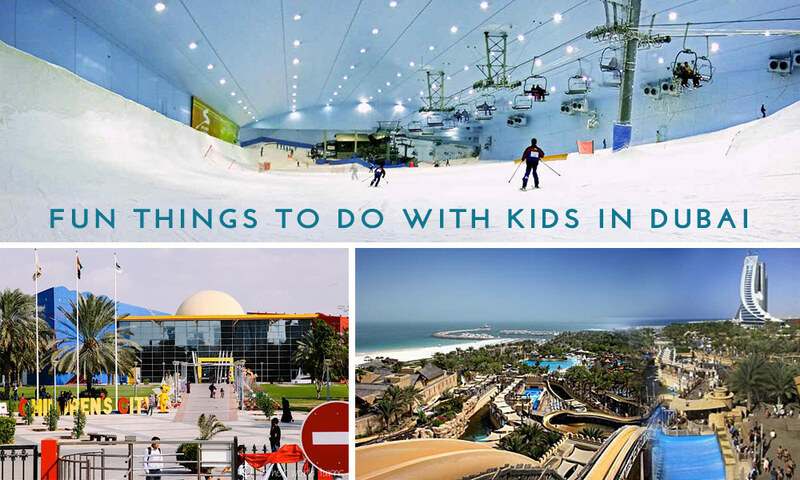 If you get a chance to visit the Mall of Emirates with your kids; particularly in the summers, then don’t forget to enjoy the splendid indoor snowboarding and skiing and ‘play and throw’ snowball games at Ski-Dubai. If you are staying there for a longer period, your children may also get admission in snowboarding lessons. You can enjoy the realistic snowy slopes, and even if your little one is too young to be handled, then you can manage at food courts and interactive penguins’ experience at Snow Park. Wild-Wadi Water Park is a great water park located at Jumeirah Beach Hotel. It offers numerous slides, rides, surfing and fun activities for kids and adults in Dubai. It’s a perfect fun place for a whole family. This park is an affordable family fun that you can gratify with your kids. The Wild Wadi Water Park is one of the oldest attractions for kids in Dubai and a must visit if you want to give your kids a day full of fun. Located in The Dubai Mall, Kidzania offers you and your children a distinctive, highly realistic and safe learning environment which entertain your kids to do what comes to them naturally. Your children enjoy role playing while performing realistic model-based jobs and choosing their favorite careers. If your kids are between 4 to 12 years, this place is a real fun-based learning experience for them. The place charges 95 AED for toddlers and 140 AED for younger kids, however, children aged under 2 get free entry. You must have not been to a gigantic aquarium like this. Located inside the Dubai Mall; the Dubai Aquarium & Underwater Zoo is the largest acrylic-made aquarium that displays hundreds of fish, sharks and rays. You can stroll through the pedestrian tube to get your kids a closer look at the sea life. Above this huge aquarium is an underwater zoo where your children may enjoy watching trained otters who can paint, amazing rare insects and dancing penguins. If you want to educate your children about marine life & species, a visit to Dubai Aquarium & Underwater Zoo should be in your list of fun things to do in Dubai with kids. A holiday in Dubai is absolutely incomplete without a water park, and especially if its summers. The Aquaventure Park water park is located on the edge of the immense human-made island, entitled Atlantis Resort, The Palm. Kids may find here adrenaline-rushing and heart-throbbing slides, shark attack, deluxe size aquarium and other fun activities like mysterious and amusing ‘The lost world of Atlantis’ activities. You can also buy a combo ticket for all the activities or may pay separately. Aquaventure Park is a relatively new attraction in Dubai for kids, but due to the adventure and fun it offers, it should be in your list of things to do with kids in Dubai. If you are visiting Dubai in hot summers, then you may find a small oasis inside the Dubai Mall. Your kids would surely enjoy the huge Olympic sized rink for ice-skating to turn themselves cool. With expert and friendly trainers and artificial balancing penguin-pals, your children are super-safe to balance themselves at Dubai Ice Rink. Surprisingly, it only charges 55 AED for a 2 hour session. No kids, little kids or big kids, camping in Safari is an absolute fun. Camping night is a fun that is equally enjoyed by young and old; where you enjoyed an extraordinary 4-wheel drive while having a tremendous Arabic feast in dinner and enjoy belly dance and spectacular customary shows. You can contact your hotel to get the tour arrange for you and can also directly contact with the local tourism businesses. If you and your kids love Dolphins, then the great Dubai Dolphinarium provides you the opportunity to interact with these loveable creatures. Additionally, your kids will also love watching them performing tricks with trainers. Your kids may also allow have fun to swim with Bottlenose dolphins and Fur seals. Dubai Dolphinarium is located at Dreamland and AL-Ain City and a visit there is a recommended things to do in Dubai with kids. Located in Creek Park, Dubai Wonderland Amusement Park is a must-to-go place for your children. It is an amazingly crafted Caribbean theme park which offers thrilling slides and rides. Water-fun can also be enjoyed to stay cool in scorching summers. Wonderland Water & Theme Park is one of the best ways to spend a hot summer day with your kids in Dubai. These are some of the most amazing activities and things to do in Dubai with kids; however Dubai is a kid’s utopia that you can endlessly explore. If you want to suggest an activity in Dubai for kids, please do so by adding comments below.